I admit, when my husband first explained this dish to me, I thought it sounded horrible. He laughed, assured me it was actually very good and promised (threatened?) to make it once I’d arrived in Liepāja. (This was before I went to Latvia for the first time.) I watched him crunching up noodles and putting together a bowl with curiosity. I couldn’t imagine eating crunchy ramen — though now I feel silly because you could use those La Choy rice/wheat noodles they sell to put on salads and get the same effect. Leave the ramen sealed in its bags and crunch them up thoroughly into little crumbles. Open the bags, remove the seasoning packets and pour noodle-bits into a large bowl. Add the grated carrots, egg and the contents of one seasoning packet. Stir in mayo and sour cream, mixing well to combine. While the raw noodles may initially be offputting, they’re quite easy to eat. I like ramen salad best when it’s perfectly fresh, but for the mock-cheese salad, let it sit in the fridge for 30 minutes. 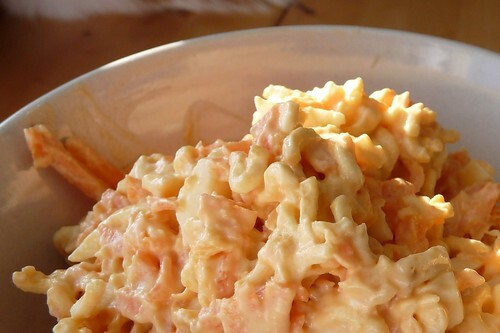 The noodles will soak up the moisture from the mayo and sour cream, becoming soft and eerily cheese-textured. This entry was posted in latvian, one-dish, recipes, salad, side, snack. Bookmark the permalink. It’s hard to say. My husband and I love salt, which is why I try never to give measurements for salt because I know it will come out too salty for many people! (That and I rarely measure salt in anything other than “pinches.”) However, once you factor in the carrots and noodles and sour cream… well, one seasoning packet really doesn’t go that far. If you’re salt-sensitive, start with half a packet, taste and add more as you like.